On February 21, 1803, Colonel Edward (Ned) Marcus Despard was publicly hanged and decapitated in London before a crowd of 20,000 for organizing a revolutionary conspiracy to overthrow King George III. His black Caribbean wife, Catherine (Kate), helped to write his gallows speech in which he proclaimed that he was a friend to the poor and oppressed. He expressed trust that "the principles of freedom, of humanity, and of justice will triumph over falsehood, tyranny, and delusion." And yet the world turned. 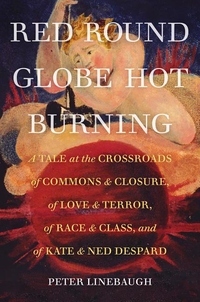 From the connected events of the American, French, Haitian, and failed Irish Revolutions, to the Anthropocene's birth amidst enclosures, war-making global capitalism, slave labor plantations, and factory machine production, Red Round Globe Hot Burning throws readers into the pivotal moment of the last two millennia. This monumental history, packed with a wealth of detail, presents a comprehensive chronicle of the resistance to the demise of communal regimes. Peter Linebaugh's extraordinary narrative recovers the death-defying heroism of extended networks of underground resisters fighting against privatization of the commons accomplished by two new political entities, the U.S.A. and the U.K., that we now know would dispossess people around the world through today. Red Round Globe Hot Burning is the culmination of a lifetime of research--encapsulated through an epic tale of love.